Klahowya was Rosie's last baby for us, and has finally finished growing up! Like full-sister Saucony, she is verging on overly-tall by our preferences at 46". Like all her full sibs, Klahowya is prone to be weight-control challenged, but is much the easiest of the bunch to keep at optimum weight. Klahowya's coat exemplifies the highly-desirable standard (short) type to perfection. She had excellent packing potential. We produced Klahowya with the intent to sell her, but life has its twists and turns. First, full sister Saucony let us know she was emphatically interested in working, not dealing with babies, and so it was Saucony who found a new home instead. Then, during the winter of 2016-17, Klahowya re-aggrevated an injury that occured either during transport or during the night after she arrived here (she was born and raised to weaning on another farm). Although Klahowya currently shows no gait unsoundness, she now "clicks" loudly when cantering (not when walking, nor when turning). The clicking had arisen once before and disappeared, but this time it is obviously not going away. We can only expect that this will progress over time and that most likely Klahowya will eventually have one hind leg compromised to some degree. 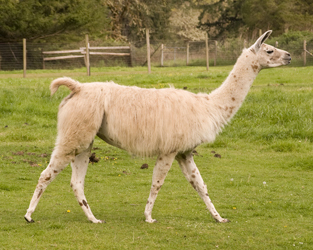 A llama comparable to Klahowya (including true Classic coat, outcross working genetics, congenial disposition, and striking appearance) is a rare find, and we know that in spades. Klahowya and her relatives also have outstanding reproductive and maternal traits — important things that we've learned (the hard way) are much, much rarer than we're all led to believe. So Klahowya will be breeding here for as long as she is comfortable doing so, and then we give her the retirement home she deserves, whenever that turns out to be (we sure hope it won't be anytime soon). Klahowya's strong-and-confident nonbreeder half-sister Peanut and full sister Saucony are working packers for a family of outdoor and hunting enthusiast, and Klahowya's powerful full brother Credo (PLTA MPL certified) is a working packer in WA state (we have retained two of his offspring in our herd). Although Klahowya's own packing ability can never be safely assessed, we are confident that she would have performed to our standards. Klahowya loves "cookies" (llama treats)!!! Klahowya is the Chinook jargon friendly greeting; Chinook jargon, for those who don't know, was the near-universal trade and inter-tribal language of the Pacific Northwest, spoken by Native Americans and whites alike whenever a common tongue was required. Klahowya is, like her mother and all her sisters, prone to bestowing pleasant greetings on all who meet her.